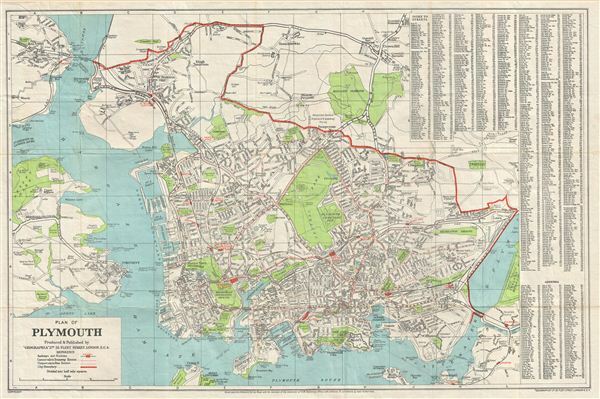 An uncommon c. 1930 map of Plymouth, england, by Geographia Ltd. The map covers Plymouth from the Hamoaze and Plymouth Sound to the River Plym and Crown Hill. The map identifies all streets, parks, cemeteries, ferries, docks, rail lines, and important buildings. Cartographically this map has been derived from the Ordnance Survey from which it has been reduced to a more manageable size. This map predates the post-World War I redesign of Plymouth by Sir Patrick Abercrombie in 1943. Issued by Geographia Ltd. From its offices at 55 Fleet Street, London. Geographia, Ltd. (fl. c 1910 - 1985) was a London based cartographic publishing firm. The company was founded by Alexander Gross (1879-1958), a Hungarian immigrant to the United Kingdom. Geographia is best known for its folding pocket maps and globes. Later in the early 20th century, Geographia expanded with offices in New York at 11 John Street and issued a large corpus of U.S. focused maps and city plans. In the later part of the 1980s the firm was bought out by Harper Collins and continues to produces maps under the Collins Bartholomew imprint. Very good. Backed with linen. Minor wear on original fold lines.